Let the elegance of an art deco ring sway you into purchasing one for your beautiful bride-to-be. The old world charm of art deco rings has been a popular choice among couples that are looking for something unique and elegant. This isn’t to say that your typical diamond ring isn’t suitable for your bride-to-be; it’s just that art deco rings provide a different voice within their bold streamlined-geometric look. Inspired by the architecture and artwork of the Native Americans, Greeks, and Egyptians, art deco rings have found a humble home in the world of engagement rings. The suffrage movement of women is displayed within the artwork. One can visualize the independence that these women fought for through the boldness of the crafted style. Their sleek, clean cut conveys nothing but pure elegance and class. These styles were totally in contrast to the neutral Edwardian designs and showcase a clean sense of sophistication, which is clearly reflected in art deco rings today. Now, don’t mistake bold for being overly dramatic in terms of details or intricacies. Realistically, these rings weren’t made with being “fancy” in mind, but for a genuine look. Many of these rings can be found in estate jewellery sales, but it’s important that if you decide to take this route that you approach it with caution. With an abundance of knock-offs and fakes floating around, you may come across a ring that’s worth no more than a mass-produced product. It’s best to approach a professional that has years of experience, such as Cynthia Findlay Antiques, a prestigious family business that offers custom jewellery in Toronto. Not only will these established jewellers provide you with a sense of direction on where to find the perfect art deco ring, but they might even carry them for which you can purchase. So, what are you waiting for? Cynthia Findlay Antiques and other reputable establishments are waiting to help you today. 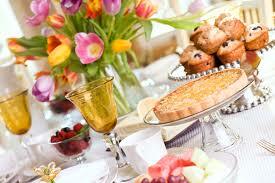 Easter brunch is a fun event to catch up with family and friends. These events usually involve a mixed bag of people, from well know family, kids, to in-laws and friends. Easter functions are also scheduled during midday to early evening. Therefore, finding an outfit for Easter can be confusing. Here are a few tips to help you select an out that is appropriate, yet flattering. Outfit – Since a lot of your family will be at this event, it is best to choose an outfit that is conservative but chic. With kids, uncles and aunts present, leave the low cut tops, the super short skirts and the fake lashes at home. Look at wearing a skater dress in a block color or a floral print. Choose a light summery shade like powder pink or pastel blue/ yellow. Your hemline should reach past your upper thigh. Hair – Your look should be soft and effortless. Use a straightener to create soft curls or go super straight. Make up – Use a good foundation and a little blusher. If you feel bare with this look, add a bit of eyeliner and some tinted gloss. Avoid shimmery eye shadows and face contouring. Shoes – Think cute flats or dainty sandals. Remember that you may have to assist the host (since the host is usually family), so comfort is key. If you don’t feel dressed without a heel, go for a small 2 inch heel. Nails – Brighter, shorter nails are in this Spring. Make your color pop; think hot pink, purple, coral, teal, yellow, orange.